The Trump administration is now allowing the remains of elephants legally hunted in Zimbabwe and Zambia to be imported to the United States as trophies, with officials signaling they will expand efforts to promote trophy hunting as a form of conservation. African elephants are listed as threatened under the Endangered Species Act, but the U.S. Fish and Wildlife Service has determined that large sums paid for permits to hunt the animals could actually help them “by putting much-needed revenue back into conservation,” according to an agency statement late Wednesday. Under the Obama administration, elephant-hunting trophies were allowed in South Africa and Namibia but not in Zimbabwe because Fish and Wildlife decided in 2015 that the nation had failed to prove that its management of elephants enhanced the population. At the time, Zimbabwe could not confirm its elephant population in a way that was acceptable to U.S. officials and did not demonstrate an ability to implement laws to protect it. He's always been a fan of trophy hunting. Nothing new there. Remember Cecil the lion? “Sometimes people hold a core belief that is very strong. When they are presented with evidence that works against that belief, the new evidence cannot be accepted. It would create a feeling that is extremely uncomfortable, called cognitive dissonance. And because it is so important to protect the core belief, they will rationalize,ignore and even deny anything that doesn't fit in with the core belief." 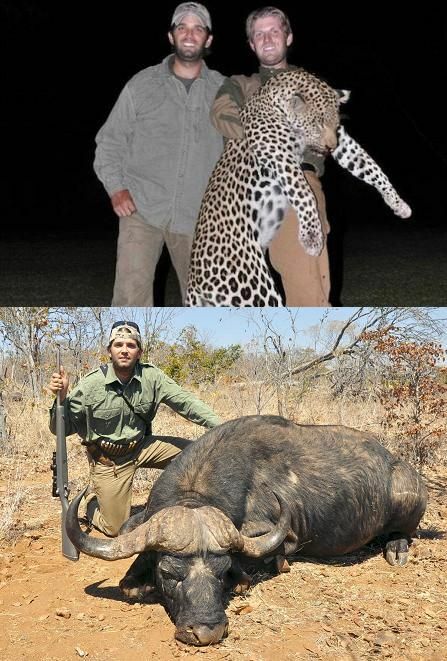 Actually, it's for his son, Don Jr. Jr. is an avid elephant hunter. So now we'll be awash in ivory carvings. 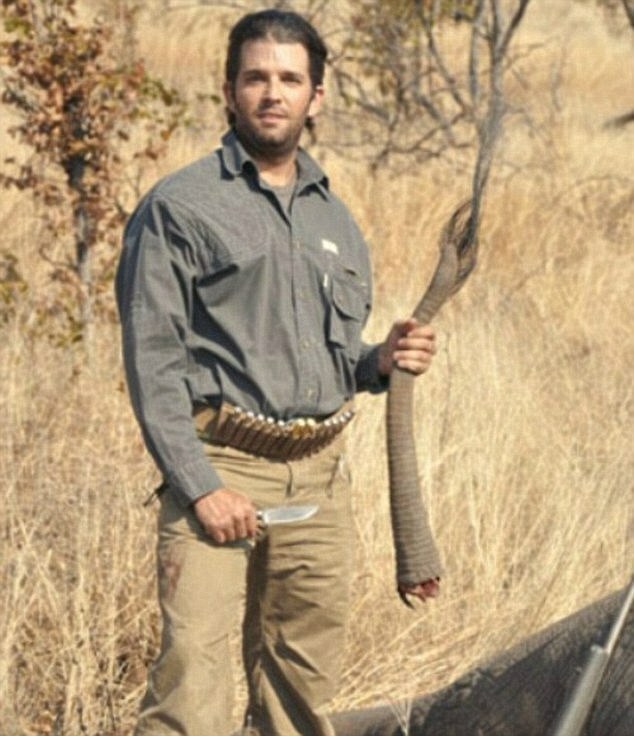 Original Quill wrote: Actually, it's for his son, Don Jr. Jr. is an avid elephant hunter. He needs assassinating. Along with his dad. It's not really a ban on hunting, but a ban on the importation of the hunted animals. The US Fish and Wildlife service knows what it's doing, as do there counterparts in African nations. Elephant populations are feeling pressure in certain areas, but that is due to poaching, not legitimate hunters. All animal populations can be controlled while harvesting animals. That's why there's not a sheep shortage in Wales, in spite of millions of animals being harvested every year. 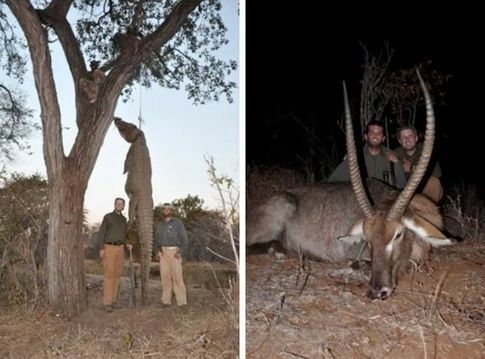 Maddog wrote: It's not really a ban on hunting, but a ban on the importation of the hunted animals. The US Fish and Wildlife service knows what it's doing, as do there counterparts in African nations. Elephant populations are feeling pressure in certain areas, but that is due to poaching, not legitimate hunters. All animal populations can be controlled while harvesting animals. That's why there's not a sheep shortage in Wales, in spite of millions of animals being harvested every year. Are you not familiar with game management? It's the same concept that is applied to domestic animals. It's why there is not a cow shortage (or any wildlife for that matter) in Texas. You think that actually means something, based on your original point? Yes. Conservation methods have been very successful. Is this really news to you? How many species are now extinct in the last decade? Where proper conservation methods were followed? You think that is a plus? I think protecting all species is a plus. I like living in an area with an abundance of wildlife. But I'm a weirdo. By claiming there is not a sheep shortage in wales, based on your ignorance of biology and the fact you have the intellect of a toddler? erm...I think you owe maddog an appology???? So what were you implying smelly? have I broken any said rules and what abuse did I say? So I am can be called any name under the sun, but me calling a poster a racist who defends the south in the American civil war is an outrage? have I pulled you up for giving back abuse to anyone else in tis instance? why cant you just accept a bit of advice? Lord Foul wrote: has maddog abused you? So tell me how is calling someone a racist abuse? Then exaplin why you pulled me up on this and not smelly's comments on the welsh and mugabe being a Black dog? Mugabe maybe the lowest scum on the earth bujt smelly can get away with being hatefuk and racist and you pull me up over a mistaken post i placed on Maddog, where it is irrelevant on his apologism to the Conferate south? Does that make you happy Victor? methinks you are getting a woody out of being outraged on behalf of someone else, without their permission and with no cause to be...a trait i thought was totally lefty....you havnt crossed the house have you? He is a criminal and yet you and smelly went off the fact that he is labelled black and fail to see that is often used to describe black people with animals and in this case dogs. If THEY dont care why should you? oh and how??? just HOW?????? can I possibly, in any way be "racist" to a yorkshireman??? Lord Foul wrote: so...what are you saying?? Does anyone ever class Hitler as a white dog? Stalin as a white Dog? You see how the racist mindset is, as would you ever class either as a white dog? Why not just call him a dog, but the word black, inheranty makes it racial and you know it certainly does. No races exist, but does that mean racism does not exist? Do you need a white pointy hat mate? Now Victor knows I am right, lets see if he admits to this?? I just proved myself wrong, as it does exist. I get called all manner of names, doesn't bother me in the least. But I do understand biology and conservation. Which is why I have no issue with harvesting animals as long as there has been a census of those animals and the harvest is directed at the correct animals in terms of age, gender, location and animal quality. Which is essentially based on a premise you percive is it not? That you feel comfortable over? You see how the racist mindset is, as would you ever class either a a white dog? Do you need a white pointy hate mate? And, despite all the twaddle you have put forth this business of "no such thing as race" is patently no more scientifically sound than eugenics in the 30's. clearly there are differences between peoples of different areas, Visible differences, not just in skin colour but in staure and facial features too. Now Dont tell me thats not genetic differences or that it doesnt follow the rules of genetics and MUST therefor be a genetically inherited trait. I'm well aware of the work thats been done in a desperate attempt to deny "races" but one has to ask what was their core starting point....how big a difference did they define as being necessary to define a race...? would a mere codon do? I mean seriously ...are you telling me theres no discernable difference between me an my hottentot friend? I wouldn't call wildlife biology a premise. It's an actual scientific endeavor. Well then tell me what you do? I listen to the wildlife biologists, and only harvest animals that they have directed me to harvest. Well you tell me didge. Do you make a habit of accusing people of racism without understanding what they are talking about?? What was I implying didge that made you think I was racist?? Have you ever called Hilary a white dog? Take your time answering that? You have posted so much racially based, xenophobic, hatemongering and divisive drivel over the years, that you leave no doubt over your racist, fascist and pro-Apartheid proclivities..
You, Smelly', are clearly the one individual on NF who has no hope of defending yourself against anybody labelling you a "racist" -- using any definition of that term. The conversation was about mugabe and not about Hitler?? Why would I randomly scream "Hitler is a white dog" in a conversation about mugabe?? Secondly what you appear to be saying is that its OK to be racist towards black, but ONLY if you are racist towards whites first. Do you want me to say Hitler is a white dog? Not that I want you moderated, its more about the PC of the mods themselves. Its like they seem to think they will lose if they do moderate you. There isn't anything TO moderate. If you were a mod, what would you do?? What is it you think the mods should be doing to me, and for what reasons? ?